Dahlia Lithwick on the Nazis in Charlottesville. White supremacists can march on my hometown, but they can’t win. 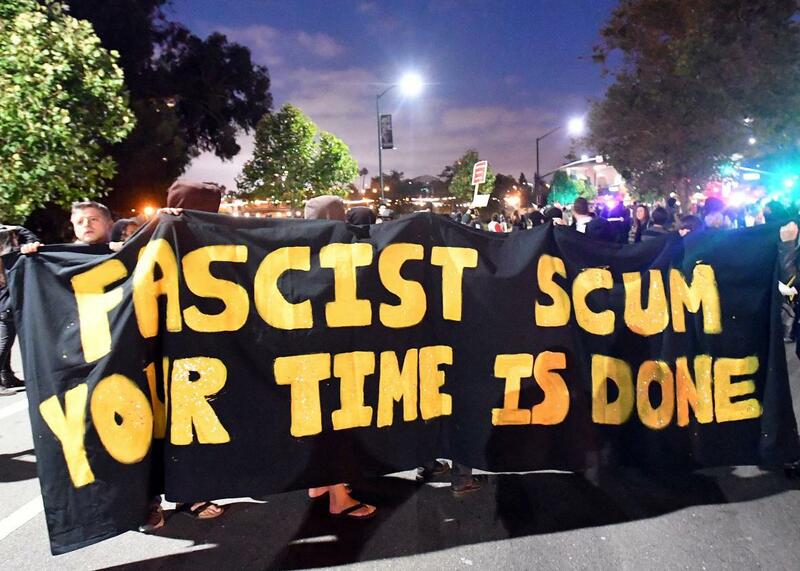 A message for the sad pack of Nazis chanting “You will not replace us”: Too late. Above, protesters march against racism in Oakland, California, on Saturday. When the red dust of Virginia settles, after this horrifying weekend in my hometown of Charlottesville, one thing will be clear: The white nationalists and Nazis who marched through town this Friday and Saturday perfectly reflected the President Trump they so admire. Their slogan—”You will not replace us”—is, in Trumpian fashion, a pledge to restore vanishing privilege and power. It’s also a bald-faced lie, a fake promise and a short con. Not one single word of it is true. Our lawyer once told us, when we purchased our home in Charlottesville, that the house to this day carries a racially restrictive covenant. No blacks, no Jews. That covenant is illegal and unenforceable. And so I have a house in Charlottesville that could once have been taken from me by the force of law. But for sad white men who think they can ride into my town and insist that I will not replace them (sometimes “You will not replace us” became “Jews will not replace us” in their chanting), I have a message: You’ve been replaced. You have been replaced because over two centuries American courts have renounced and rejected the argument that housing, education, marriage, and other markers of status and belonging can be used by whites and males to diminish the power of “others” to gain purchase on American life. Know one other thing about the monuments to Stonewall Jackson and Robert E. Lee—the holy sites to which these men made their sad pilgrimage, and where a young woman, Heather Heyer, was mowed down in cold blood. These pretend war memorials were themselves efforts at racial devaluation, made a century ago, and long after the Civil War, when flaming torches had stopped working but adverse possession and racial rezoning could still do the trick. They represented familiar attempts by white men to shout to an economically thriving black community in Charlottesville that “You will not replace us.” A tawdry but effective stunt to reclaim black spaces for local whites. But rezoning and adverse possession and Jim Crow no longer preserve Emancipation Park for white people. Our city council has decided to remove the monuments, and though the order is currently stayed, I believe it will prevail. And most days, the park sees people of every race, faith, and color headed to their places of worship, their library, their courthouses, their yoga classes, and their dry cleaners, without concern for out-of-town Nazis. By Monday, when all but our handful of misfit home-grown white supremacists have slithered away, it will revert to us. They will have been replaced. The scars and horrors endured by Charlottesville this weekend will persist, but so will its heroes. The clergy members who stood between the white supremacists and the town, the locals who sang and handed out water, the activists who civilly held their ground, the teachers and students who reclaimed the UVA campus for tolerance, our hospital workers, and Heather Heyer, who gave her life. But Charlottesville has other heroes, too: every child who watched Nickelodeon in her basement, every University of Virginia student who will arrive on campus this month, the Syrian immigrant families just settling into new homes and jobs, and the black children who will start middle school and take out library books and swim today at Meade Park. They belong here, and now they will go back to the business of paying taxes and library fines, and educating the young, and picking up dry cleaning. We will go back to working, as we’ve been doing for years, on what to do with our Confederate statues, and how to fix our still-fraught policing and housing problems, and whether our elected officials handled all this as well as they might have. But the guys who slunk away this weekend in trails of their own hateful ooze will be gone. The tiki torches from the patio furniture section are in dumpsters all over town. We aren’t “replacing” these folks. They were entitled to nothing they were demanding. Some of this administration’s legal and policy efforts may succeed for a time, but they will end in the way of flaming torches, unenforceable restrictive covenants, racially discriminatory adverse possession, and zoning tricks. These practices will end the way reverse-engineered monuments to the Lost Cause will eventually end in Charlottesville. They will be replaced. The Nazis may come to town, terrorize and threaten people with guns, even brutally murder a young woman. This president may fail to condemn it. But all right-thinking Americans will recoil in horror. And white supremacists will be replaced. There is no room for them here. On Saturday they were relegated to parking at the shopping mall and walking miles in the hot sun, in their sad supervillain Comic-Con outfits. Today they are already slinking back to their own homes, where they are also being replaced, by history, by moral justice, and by our children, who are growing up exactly where they belong, at home, irreplaceable, sacred, and, especially today, brave.